We designers, wanting to do what's right but afraid to make trouble, will keep sitting, maybe just a little more nervously, our fingers on our control panels, waiting for permission. At Kern and Burn, we’re big fans of digestible bits of inspiration.Yesterday, we mentioned Josh Brewer’s 52 Weeks of UX, short weekly lessons on designing the user experience. 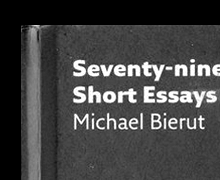 Today, we focus on another one of our favorite bite-sized collections of design wisdom—Michael Bierut‘s book Seventy-Nine Short Essays on Design. One of our favorite essays is “Waiting for Permission.” It was originally written in the early ’90s, and revised for the book’s publication in 2007. We now return to it through the lens of Kern and Burn. Although written nearly 20 years ago—when we were both coloring with crayons—we love this essay’s call to action and think it is completely relevant for design entrepreneurs today. Many design entrepreneurs may not have to fight clients for an equal partnership, but they may fight the idea that other people know better than they do. One thing we hope our 100 Days proves is that many of today’s design leaders are willing to admit they don’t know what they are doing. They work hard to follow their passions, and learn everything as they go. This means that you’re free to learn as you go. Today, more than ever, the tools and the support are there for designers to do something with their careers. Like-minded individuals are only 140 characters away, audiences are waiting to give feedback, and talented peers are willing to help. Bierut’s essay is just one more reminder that ideas and beliefs are only as good as the actions that they evoke. If you’ve got passion, hustle, and perspective—don’t wait for permission. You can read the full essay on Typotheque, here.